Every organization needs to pay attention to trust. Trust improves metrics including productivity, employee satisfaction and ethical brand value. It makes organizations better places to work, places where people want to invest time and plan careers. 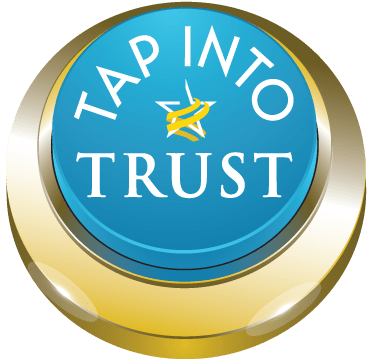 After months of discussions, writing, sorting and voting, a small group of Trust Across America Trust Alliance members (I am honored to be among them) created a tool to stimulate conversations about organizational trust – The 12 Principles for TAPping Into Trust. If you are ready to invest in building trust, this tool will help you generate discussions within your organization. Click the button to TAP INTO Trust and access the 12 Principles (in English, Spanish, French and Arabic). How will you use the 12 Principles? Which of the 12 Principles For TAPping Into Trust are our strengths? Which represent areas where we need to do better? What would it look like if we improved how we follow each principle on our “do better” list? What is our plan for closing those gaps? In other Trust Across America news, Barbara Kimmel has announced that “the 10th anniversary issue of TRUST! Magazine explores the role good governance plays in building trustworthy organizations through interviews with lead directors, board chairs and CEOs.” Check out the full issue Here. When we choose to take the trust journey, we are always learning and improving. Let’s keep the conversation open. Share in the comments how these 12 Principles are helping you TAP Into Trust! Anytime we think about another person or group as “less than,” or treat another person or group as “less than,” we are unethical. It’s very simple, really. We are all human, and as humans, we all have rights and dignity. We all have a right to be here and to be treated with respect and fairness. Attempts to portray others as “less than” may come from a desire for power, control or personal gain. They may stem from trying to overcome low self-esteem by imagined superiority. They may come from misinformation. They may come from having lost one’s own sense of humanity. In the past year, people have protested by the millions around the world to say “Enough.” The diverse groups that have gathered around the world want us to hear that, wherever it comes from, the “less than” fallacy has run its course. It is not part of who we are when we are at our best. It is not part of our successful future. Treating people as “less than” makes it more difficult for them to fully contribute to society in ways that benefit us all. It’s time to get past a “less than” mentality, recognizing it as flawed thinking, so that we can focus our attention on mutual understanding. That would brings us “more than” the capacity we need to resolve our current global challenges.